Rural Rhythm Records is proud to announce Rodney Dillard will be inducted into the Missouri Music Association’s new Hall of Fame when the organization honors its three premier inductees in the bluegrass genre: The Dillards, John Hartford and Charlie Wolfe. This new Hall of Fame will recognize Missouri talent from all genres of music and will collaborate with other music organizations within the state of Missouri, and elsewhere, to provide a central database of Missouri talent. Initially, the Hall of Fame will include talent that has already been recognized by other Halls of Fame based on their individual music genre. All three of these new inductees are currently members of the International Bluegrass Hall of Fame. The Dillards, Rodney Dillard (guitar) and Douglas Dillard (banjo), grew up playing music with their family and friends including a teenaged John Hartford, in Missouri. They performed on a St. Louis radio station as The Dillard Brothers in 1958, recording for a local label. The Dillards played their first show at Washington University in St. Louis and hit the road for Los Angeles in 1962. A DesiLu Studios rep saw an ad in Variety magazine about Elektra signing The Dillards, and within days they were called in to audition for the role of The Darlins on The Andy Griffith Show. Their original songs have become bluegrass standards like “The Old Home Place,” “Dooley,” “Doug’s Tune,” “Banjo in the Holler” and “There is a Time.” The Dillards incorporated stand-up comedy into their stage show, and their talents as entertainers brought bluegrass to new audiences in urban clubs from L.A. to New York City, on college campuses, in movie scores, at folk festivals and on tour with mainstream rock bands and comedians. The band’s unique flair for songwriting and arrangement affected a broad range of important future musicians in the bluegrass and pop music world alike, and they are credited with helping set the stage for the “country rock” movement and the burgeoning progressive sounds of bluegrass. The Dillards were inducted into the International Bluegrass Hall of Fame in 2009. Rodney Dillard now tours with “The Dillard Band” and the group is celebrating their Rural Rhythm album, I WISH LIFE WAS LIKE MAYBERRY. 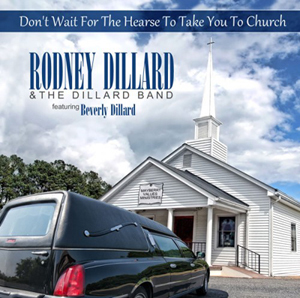 The band is gearing up for their August 16th album, DON’T WAIT FOR THE HEARSE TO TAKE YOU TO CHURCH, featuring Beverly Dillard. Rodney and Beverly Dillard also launched their new “Mayberry Values Ministry” and perform at churches and other organizations throughout the country inspiring families and individuals of all ages with their brand of humor, stories, testimonies and more. For more information including upcoming tour dates, please visit www.RodneyDillard.TV.